Cantilever racks are ideal for storing large, bulky items that differ in length and size for example lumber, steel sheets, cartons, carpet, pipes, and bar-stock. They are designed to store long objects multiple levels high, thus maximizing the use of overhead space in storage areas and providing a space efficient and cost efficient solution. Cantilever rack systems utilize upright columns with cantilever arms. The upright heights and arm lengths vary based on the application. Cantilever arms can be angled slightly to ensure that products stay safely on the racks. The arms can be adjusted to varying height levels on the upright; arms can be located on a single side or both sides. 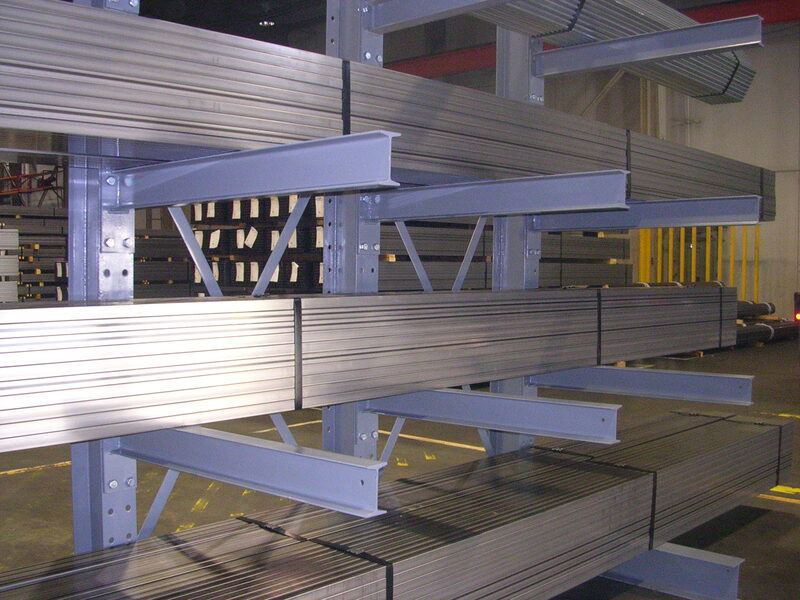 Cantilever rack systems must be properly engineered and there are a variety of design variables to be considered to ensure successful operation. Our design engineers are experts at understanding and developing all of these variables to provide our clients with successful cantilever rack systems. Call (866) 266-2244 today and one of our storage specialists can help you design a cantilever racking solution to meet your storage needs!